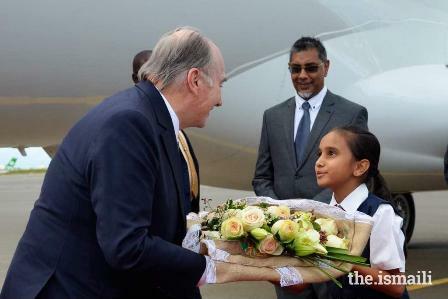 A spiritual leader of the Ismaili community (Imamat Ismaili), Prince Karim Aga Khan chose Lisbon to close the commemorations of his 60th anniversary jubilee. The celebrations will take place between July 5 and 11 and are expected to attract around 40,000 people between members of this community around the world and international guests. According to the organization's source, the program will include exhibitions and concerts under different programs set up in 2017 to mark the jubilee of the leader of this community inserted in the Shia doctrine of Islam. When the Aga Khan’s private jet touched down in Atlanta, he must have had an inkling of the type of reception he would receive. The spiritual leader of the Ismaili Muslims, a Shia sect with an estimated 15-20 million adherents worldwide, had visited the city a decade ago during his 50th anniversary year. In addition to his religious role, the Aga Khan heads a vast organization that has founded universities and museums around the world. It also runs a development agency, the Aga Khan Development Network, that employs some 80,000 people and works on health, education and environmental sustainability in some 30 countries. His net worth, estimated by Forbes, was said to have topped $800 million in 2011. From March 13-18, the Aga Khan chose Atlanta once again for a stop, this time on his Diamond Jubilee tour celebrating 60 years of service. And once again, Georgia officials rolled out the red carpet for a man thousands of their constituents hold in the highest esteem. Along with Ismaili community members, Lt. Gov. Casey Cagle City of Atlanta Chief Operating Officer Dan Gordon and Abby Turano, deputy commissioner for international relations, were on hand to receive the Aga Khan on the tarmac at Charlie Brown Field — Fulton County Airport, where the Atlanta police department provided and honor guard salute and the 116th U.S. Army band played the U.S. national anthem. Secretary of State Brian Kemp welcomed the Aga Khan to the state Capitol for a meeting with Gov. Nathan Deal, who presented him with a proclamation praising the imam’s lifetime of service to the world. “The Aga Khan continues to inspire members of the Shia Ismaili Muslim community in Georgia to actively contribute to the well-being of all citizens through civic engagement and community service initiatives,” it reads in part. But the Aga Khan’s greatest reception was still to come. Over four days, he would address an estimated 40,000 Ismailis in separate groups during private meetings held at the Georgia World Congress Center. Farida Nurani, a pharmacist by training who also volunteers as communications coordinator for the Aga Khan Council for the Southeastern United States, was among those who came out to experience a privilege unique to Ismailis Muslims: the ability to interact with their living spiritual guide. “He helps me understand the ethics of my faith. He inspires me to be a better human being, to see my world not as divided to spiritual and material world, but how they should be intertwined,” Ms. Nurani told Global Atlanta. Locally, Ismailis worship in four jamatkhanas around the metro area, including one in Gwinnett County and another in the deep red brick structure across from the Patel Plaza shopping center on Dekalb Industrial Way in Decatur. As centers of community life, they have also been active in promoting interfaith dialogue around the metro area. But it wasn’t just Atlanta Ismailis welcoming the Aga Khan. Many flew in from across the country and around the world to get a glimpse of the man they see as the heir to a 1,400-year-old tradition. Prince Shah Karim Al Husseini Aga Khan IV traces his lineage to the Prophet Muhammad and is considered the 49th generational heir to his spiritual legacy. Like other Shia groups, Ismailis believe the Islamic community should be guided by an imam from Muhammad’s line. That all started, they say, with Ali bin Abu-Talib, the Prophet’s cousin and son-in-law through marriage to his daughter Fatima. The current Aga Khan inherited his office as a 20-year-old upon the death of his father in 1957, that same year gaining the title “His Highness” from Queen Elizabeth II of England. This time, the 81-year-old’s itinerary in the U.S. was shortened versus his last trip, but according to those who attended, his message to the community remained consistent with a decade ago: Muslims should practice pluralism by accepting and working with other faiths and traditions, and they should always value, accumulate and share knowledge to help mankind. For Sandy Springs resident Nissa Kara, seeing the Aga Khan again in Atlanta helped confirm that a career change was the right move. Though her master’s of business administration had landed her a great job with a for-profit university, Ms. Kara sought greater community impact in her daily life, in keeping with the service orientation of her faith. She began volunteering at the Children’s Museum of Atlanta and later landed a full-time job there as educational outreach manager. One aspect of the job that drew her was the ability to help underprivileged kids. At the inspiration of the Aga Khan, Ismailis champion education for all young people, regardless of faith or background, and especially for girls. “I was doing my service and volunteer work as much as I could, but I knew something was missing for a very long time,” Ms. Kara said. On the Sunday before the Aga Khan’s visit, the museum held its fifth annual celebration of Navroz, a holiday marking the arrival of spring. A Haft-Sin — or seven S’s — table was decked out with customary elements: from sabzeh, a grass or plant that grows in the run-up to the celebration, to the Persian spice sumac and serkeh, a vinegar that symbolizes the patience and wisdom that come with age. The event provided visitors with a glimpse of the diversity in their backyard, but it also showed Ms. Kara’s 7-year-old daughter the reward of engaging with society over time, she said. “We never got to celebrate Navroz outside our prayers and family, so for my daughter to be able to come and celebrate at a public institution, that’s huge,” said Ms. Kara, who was born in Bangladesh and came to the United States at age 5. She didn’t always feel welcome — that came later — but she did have a place to belong. “I think what helped me was being able to turn to my community. I knew that I fit in there, and I think that what makes us so confident and so strong,” Ms. Kara said. Aleem Walji told Global Atlanta that he still finds the growth of the Ismaili community here in Atlanta astonishing, even though he was part of it himself. Mr. Walji now leads the Aga Khan Foundation USA as chief executive officer, but his long, winding journey to this point stemmed from his father’s engagement with the local community. Born in Tanzania, Mr. Walji’s family emigrated to Canada and then moved to Marietta when he was 10. In fact, his dad saw no contradiction in leading the local Rotary Club and being the mukhi, or leader, of the early Ismaili community in Atlanta. “He never saw those as anything other than symbiotic,” Mr. Walji said. It wasn’t till a later internship at the Carter Center and a degree in anthropology and Near Eastern studies at Emory University that Mr. Walji began to explore the wider world of his heritage. The Aga Khan always talked about being a global citizen, but Atlanta institutions helped Mr. Walji become one. It started with a Rotary International scholarship that sent him to American University in Cairo. The Egyptian capital holds special resonance for Ismailis, who believe the Aga Khan’s Fatimid ancestors founded the city. “In a sense, I never came back,” he said. Mr. Walji went on to the Institute of Ismaili Studies in London, then earned a master’s at the Massachusetts Institute of Technology, where he’d started through a joint Harvard-MIT Aga Khan program for Islamic architecture. After that, he worked on land-use planning in Tajikistan with the Aga Khan Development Network, then as CEO of the Aga Khan Foundation in Syria (before the civil war), with stints at Google.org, which helps nonprofits with data, and the World Bank in between. Through all this experience, he noticed a different in the Aga Khan’s approach to development work. It’s closer to the ground, and it’s long-lasting. “A lot of NGOs will go where donor funding is. They may shift when the priorities go somewhere else, but we take a very long-term perspective because we have our own resources,” Mr. Walji said. 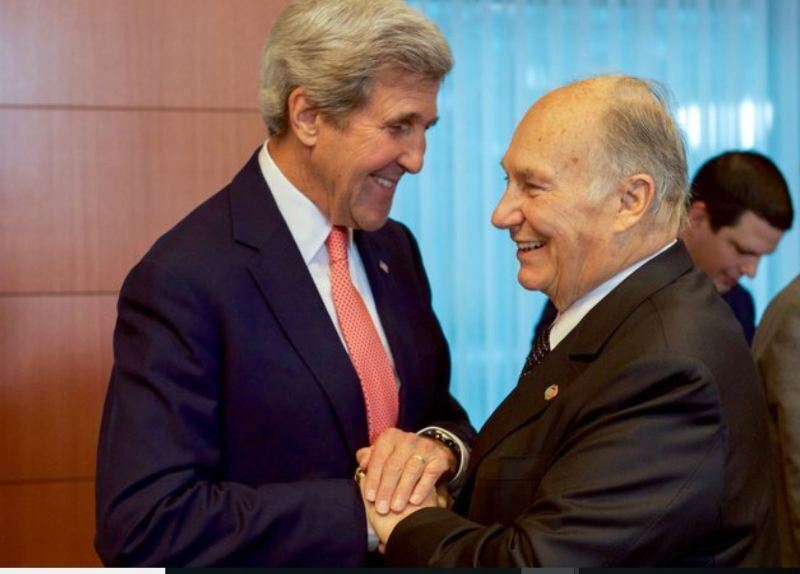 Those are largely gleaned from the global Ismaili community, allowing the Aga Khan Development Network to commit to the long haul in hard-to-reach places like Afghanistan and Syria. And working in places where Ismaili communities are active means ready access to on-the-ground volunteers who are unlikely to cut and run when things get tough. “What I realized is what we’re really good at is going to places that are difficult, remote, often in conflict or post-conflict, and instilling hope in a population,” he said. Mr. Walji’s now based in Washington, fitting given that the Aga Khan Development Network often partners with the U.S. Agency for International Development in Asia and Africa. That’s especially true in Atlanta, which Mr. Walji called the “most generous” Ismaili community in the country for his foundation. Coming back to the city was a “full circle” moment, seeing his leader in the place that kick-started his spiritual and professional journey. Atlanta was the place where he learned a simple lesson at the heart of a faith that applauds difference and encourages positive social impact. After his Atlanta visit, the Aga Khan headed to Houston, where he announced the establishment of a new Ismaili center. Our world is blessed with a hero. The founder and chairman of the Aga Khan Development Network is also the 49th hereditary imam of Shia Ismaili Muslims. His deep engagement and devotion towards humanity from the past 60 years has made him so loved by his followers. The Aga Khan grew up in Nairobi, Kenya and later graduated from Harvard University. At the age of 20, he succeeded his grandfather and assumed the role as leader of Ismaili Muslims. Since that very day, he has sprinkled love over neglected populations around the globe. His projects are widespread as they include cultural initiatives, education opportunities, health services, humanitarian assistance and overall economic development. He states it's his duty to spark changes to support social development in presenting transformations for the face of Islam. In Canada, the Aga Khan is titled the most honorary Canadian for his services. In 2014, he signed the Protocol of Understanding with the Prime Minister of Canada in order to strengthen his connection and partnership with the government. His wealth sources from voluntary donations from Muslim community members. 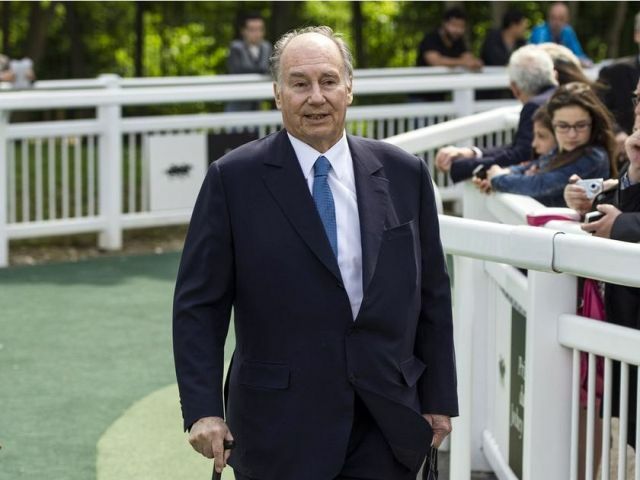 The Aga Khan owns a breeding operation as well as a multi-million dollar horse racing complex in which he derives a sufficient amount of money. To this day, the Highness continues to enhance the quality of human life purely through devotion and love. 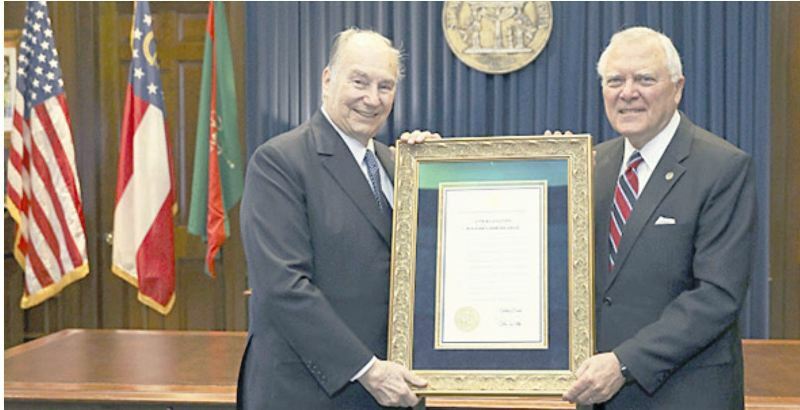 THE Aga Khan is touring the US as he marks the diamond jubilee of his leader­ship as the imam of the Shia Ismaili Mus­lim community. Last Sunday, at a lunch hosted in honour in Houston, Texas governor Greg Abbott paid tribute to the Aga Khan’s lead­ership and the achievements of his organi­sation in improving healthcare and educa­tion for people in developing countries. “We have a state motto – and that motto is friendship. This is a friendship that has lasted many years and that we expect will continue many years into the future,” the governor said. A military honour guard and saber sa­lute by the Texas A&M Ross volunteers greeted the Aga Khan upon his arrival in Texas. Secretary of state Rolando Pablos, city of Houston chief of protocol Deanea LeFlore, and Sugar Land mayor Joe Zim­merman welcomed the Aga Khan and the mayor presented him with a Key to the City of Sugar Land. Last Wednesday (14), Georgia governor Nathan Deal presented the Aga Khan with a state proclamation in recognition of his philanthropic activities. 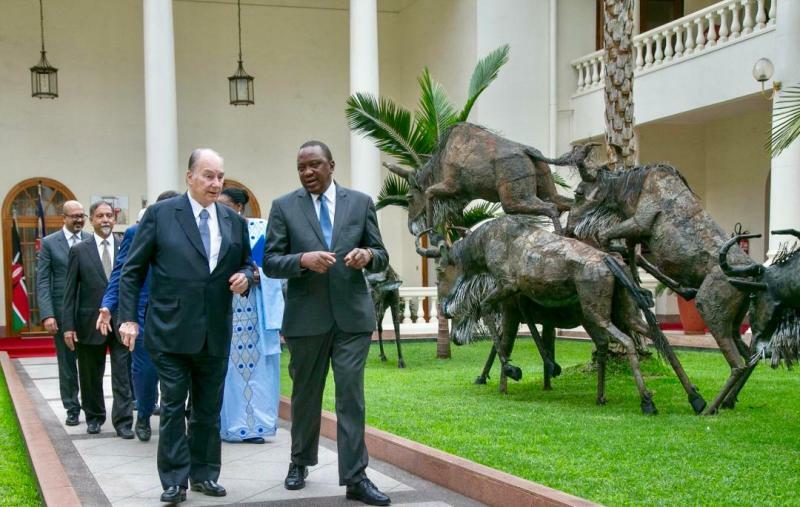 NMG Founder Aga Khan to Visit Kenya this week, to hold talks with President Kenyatta! His Highness the Aga Khan, Imam of the Shia Ismaili Muslims and Chairman of the Aga Khan Development Network, will be making an official five-day visit to Kenya this April between Wednesday April 11th – 15th. A source with close ties to Ismaili Leader, though not authorized to speak on record, has intimated to Kenyan Wallstreet that his highness will meet with President Uhuru Kenyatta as well as the country’s top officials to discuss a range of national and regional development issues in addition to other activities relating to Aga Khan Development Network (AKDN), the mother company of Nation Media Group. This visit is also part of a series of visits that coincide with the commemoration of the Aga Khan’s Diamond Jubilee, marking the 60th anniversary of his leadership as Imam of the Shia Ismaili Muslim Community. The Aga Khan founded Nation Media in 1959, and currently holds a 44.7% stake in the company through Aga Khan Development Network Foundation. The timing of the visit comes at a time when the company is about to announce its full year results amid declining revenues year after year and battered reputation. Nation Media Group will release its full year results on April 18th or 19th April. “NMG is yet to release their latest financial results. Things don’t look very rosy. Nothing to smile about. The Group has been at crossroads, politically and business wise. Apart from the overhyped digital shift, content has been another problem that has brought down sales for the group.” Said one a source with close ties to the company. In the last few weeks, a good number of talented journalists and eight senior independent columnists left NMG accusing the firm of allowing government to interfere with editorial decisions, a charge that NMG has denied. Aga Khan has built a range of activities in kenya – in education (Aga Khan schools), in health care (Aga Khan Hospital), commerce, tourism (TPS Serena Hotels), finance (Diamond Trust Bank & Jubilee Insurance), and other fields. 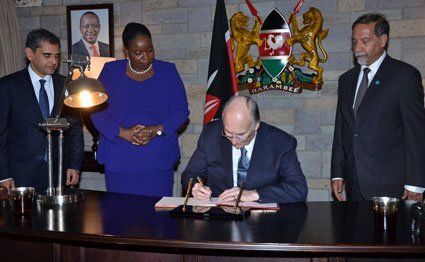 Nation Media Group (NMG) principal shareholder, His Highness the Aga Khan, is expected to jet in tomorrow for a five-day visit in Kenya. 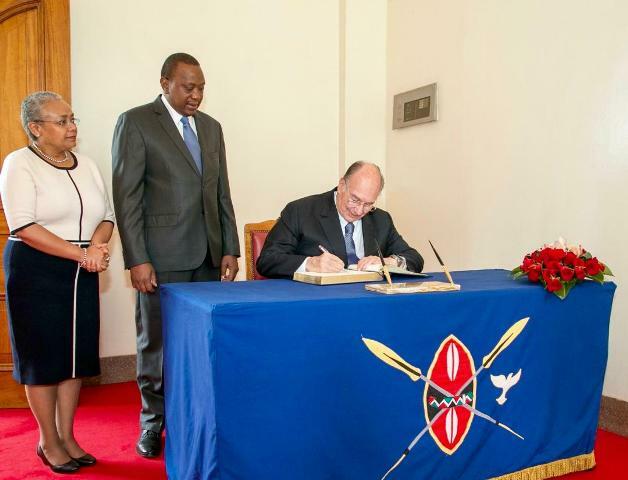 The Aga Khan – Imam of the Shia Ismaili Muslims and Chairman of the Aga Khan Development Network – regularly tours Kenya to check on his businesses but this year’s visit will be closely watched in the wake of reports that he is considering selling off substantial shares in his flagship company, Nation Media Group, to President Uhuru Kenyatta’s family. 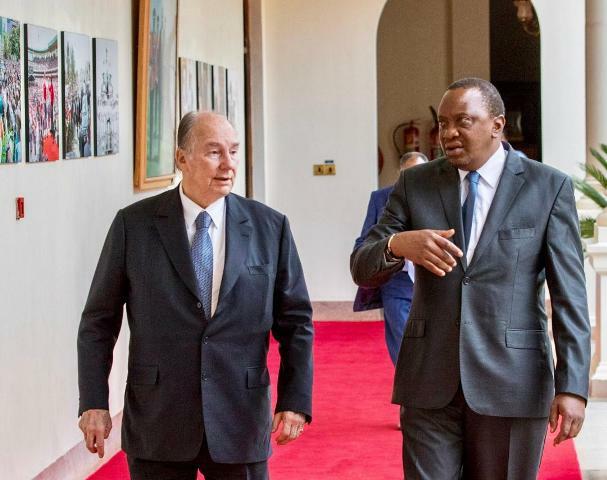 In fact, Aga Khan is expected to meet with President Kenyatta to discuss a range of development issues in addition to other activities relating to Aga Khan Development Network (AKDN), which manages his businesses in the region. It is understood that Uhuru, with the backing of rich investors from Central Kenya, is bidding for a big stake in NMG, Kenya’s leading media house in terms of revenues. The Aga Khan, who founded Nation Media Group in 1959, currently holds a 44.7% stake in the company, which is listed at the Nairobi Securities Exchange. It is expected that talks on the sale will be finalised during his visit. Sources close to NMG have indicated that Aga Khan is likely to sell just a part of his shareholding, as he holds NMG very dearly. The last time the two met was in 2015, when Aga Khan visited Kenya and since then things have never been the same for NMG. But he will confront a not-so-good-looking NMG, which has have been experiencing a slowdown in earnings over the past three years. The company’s board is expected to meet this week and it is believed Aga Khan will attend the meeting at which the company’s financial results for 2017 will be discussed and approved for release sometime next week. There has been speculation about the results, with market watchers saying the delay could be a pointer to a further drop in profitability. The group reported a Ksh500 million drop in profitability for 2016, recording Ksh1.68 billion in after tax profit down from Ksh2.22 billion a year earlier. In the half-year of 2017, the company returned Ksh825.6 million profit after tax in the six months to June, a 5% increase from Ksh785.4 million in the same period last year. Aga Khan got the feel of the company’s performance recently when NMG representatives presented their business at the Aga Khan global meeting in France. Also, the company has recently lost a number of journalists to its rivals, with NTV being the hardest hit. Two weeks ago, eight columnists resigned over what they termed as interference though the company’s management has defended its editorial decisions, arguing that it has always played by journalism code of ethics and its in house policies. Its share price has been hit by these negative developments. Aga Khan’s visit coincides with the commemoration of his Diamond Jubilee, marking the 60th anniversary of his leadership as Imam of the Shia Ismaili Muslim Community. Mawlana Hazar Imam today arrived at the Jomo Kenyatta International Airport in Nairobi for his Diamond Jubilee visit to Kenya. Upon his arrival, Hazar Imam was received by Monica Juma, Cabinet Secretary, Ministry of Foreign Affairs and International Trade, as well as leaders from the Jamat and the Aga Khan Development Network (AKDN). Driving into Nairobi from the airport, Hazar Imam was warmly welcomed by the Jamat who had lined the streets along Limuru road, outside the Aga Khan University Hospital and Darkhana Jamatkhana complex in Parklands. Mawlana Hazar Imam is in Kenya at the invitation of the Government and is expected to meet with His Excellency Uhuru Kenyatta, President of the Republic of Kenya, at State House tomorrow. The meeting is an occasion to acknowledge the longstanding partnership between Kenya and the Ismaili Imamat, through the activities of AKDN agencies in the country. The AKDN has been engaged in the development of Kenya for over a century and has enjoyed a strong relationship with the government. An Agreement of Cooperation for Development was signed with the Government of Kenya in 1996 and recognises AKDN’s contributions to national development, while creating an enabling framework for its activities. On Saturday, Mawlana Hazar Imam is expected to grace the Jamat with a Diamond Jubilee Darbar in Nairobi. In addition to the Kenyan jurisdiction Jamat, which includes Rwanda, Burundi, Namibia, and South Africa; the Jamat of the Malagasy Republic, and the Democratic Republic of Congo have also been invited to participate in this historic occasion. Hazar Imam’s visit to Kenya continues the commemoration of his year-long Diamond Jubilee, the celebrations of which represent a recognition of the Imam’s work over the past 60 years, and an opportunity to launch new initiatives. In Kenya, past Jubilee initiatives have included the Platinum Jubilee Hospital inaugurated in 1958, which is now the non-profit Aga Khan University Hospital in Nairobi; the Diamond Jubilee Investment Trust, which started off as a community lending enterprise, and grew into a major retail financial institution – now called Diamond Trust Bank (DTB) – that helps promote small and medium enterprises across East Africa; and the Jubilee Insurance companies, the largest providers of life and medical insurance across East Africa and Asia. 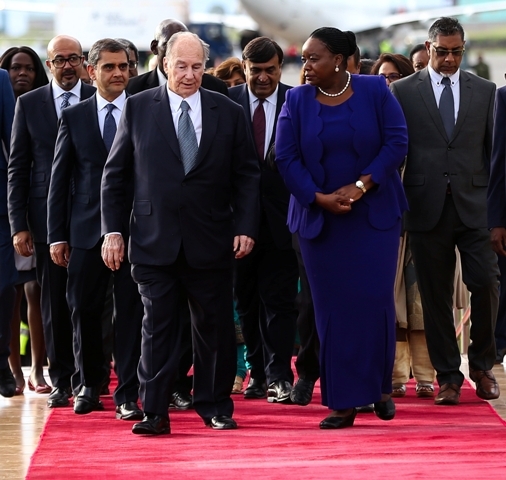 His Highness the Aga Khan has arrived in Kenya at the invitation of the State. The spiritual leader of the Shia Ismaili Muslims was received by Foreign Affairs CS Monica Juma. He is expected to meet with President Uhuru Kenyatta at State House, Nairobi. 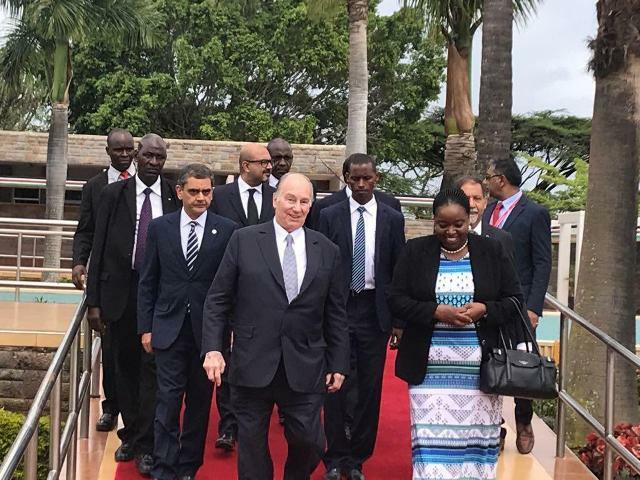 The spiritual leader of the Shia Ismaili Muslims was received by Foreign Affairs CS Monica Juma and leaders from his community as well as the Aga Khan Development Network (AKDN). The Aga Khan’s arrival is part of celebrations to mark his Diamond Jubilee, 60 years since his accession to his role of spiritual leadership. The year-long celebration commenced on July 11, last year. Some of the organizations spearheaded by the spiritual leader include the Nation Media Group, Aga Khan University Hospital, Diamond Trust Bank (DTB), Jubilee Insurance and Aga Khan schools. However, there have been speculations that the Aga Khan– principal shareholder of Nation Media Group–may be looking to divest from his long time interest in both the print and broadcast industry. 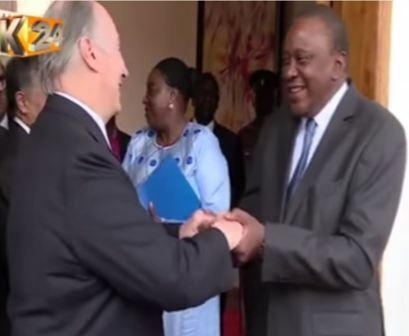 While in Nairobi, the Aga Khan is expected to meet with President Uhuru Kenyatta at State House. The meeting will focus on the longstanding partnership between the Imamat and the Aga Khan Development Network. The AKDN has been engaged in the development of Kenya for over a century and has enjoyed a strong relationship with the government. An Agreement of Cooperation for Development was signed with Kenya in 1996 and recognises AKDN’s contributions to national development while creating an enabling framework for its activities. The Aga Khan, 49th hereditary Imam (spiritual leader) of the Shia Ismaili Muslims, is visiting Kenya at the invitation of the government. 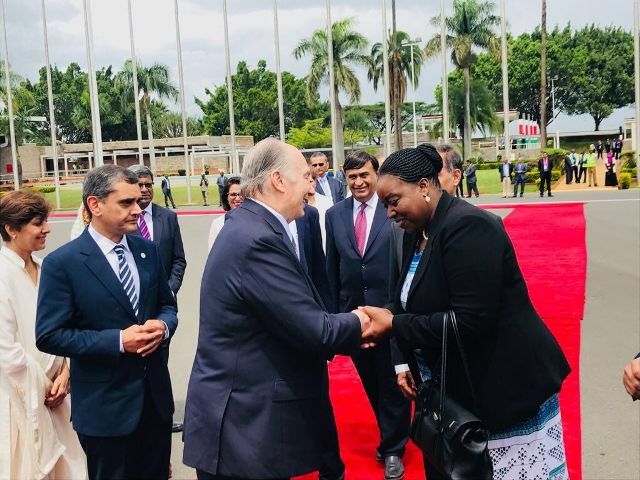 He landed at the Jomo Kenyatta International Airport in Nairobi on Thursday evening was received by Foreign Affairs Cabinet Secretary Monica Juma and leaders from the Ismaili community and the Aga Khan Development Network (AKDN). Through its several interventions in education, health, poverty alleviation, finance, insurance, tourism promotion, conservation and civil society strengthening, AKDN has been improving the quality of life of Kenyans. Every year, the AKDN touches the lives of over 7.5 million Kenyans directly and 4 million indirectly. The visit to Kenya marks the Aga Khan’s Diamond Jubilee— 60 years since his accession to his role of spiritual leadership, and is part of a year-long celebration which commenced on July 11, 2017. The Diamond Jubilee celebrations represent both a recognition of the Aga Khan’s work over the last 60 years and an opportunity to launch new initiatives. In October last year, the Aga Khan launched the Global Centre for Pluralism Awards— amongst the recipients was Kenyan Alice Nderitu; peacemaker, conflict mediator and gender equality advocate, who was recognized for unparalleled and sustained commitment to building more inclusive, peaceful societies. In Kenya, past Jubilee initiatives have included the Platinum Jubilee Hospital, which was inaugurated by the Aga Khan in 1958 and which is now the non-profit Aga Khan University Hospital in Nairobi (one of the few hospitals in Africa to be ISO- and JCI-accredited); the Diamond Jubilee Investment Trust, which started off as a community lending enterprise, and grew into a major retail financial institution – now called Diamond Trust Bank (DTB) – that helps promote small and medium enterprises across East Africa; the Jubilee Insurance companies, the largest providers of life and medical insurance across East Africa and Asia; and the non-profit Diamond Jubilee Schools in India and Pakistan, which were among the first to educate girls. Ten years ago, during his Golden Jubilee, the Aga Khan expanded the role of the Faculty of Health Sciences at the Aga Khan University and Heart and Cancer. Little Umaeza handed a bouquet of flowers to welcome Mowlana Hazar Imam at the JKIA in Nairobi, Kenya. She said "Welcome to Kenya Hazar Imam" and Mowlana Hazar replied "Thank you. I am happy to be here". Today, H.E. President Uhuru Kenyatta, President and Commander in Chief of the Defence Forces of the Republic of Kenya, held talks with His Highness the Aga Khan, the 49th hereditary and current Imam of the Shia Imami Ismaili Muslims, at State House, Nairobi. His Highness the Aga Khan is in Kenya from 12th to 14th April 2018 to commemorate his Diamond Jubilee. President Kenyatta congratulated His Highness the Aga Khan on this diamond Jubilee celebration, wishing him and the Ismailia community the very best wishes. The Ismaili community has, and continues to be, a part of the Kenyan history with investments and development to Kenya spanning over 100 years. Under the leadership of His Highness the Agha Khan, a number of institutions have been established that have made significant contribution to Kenyan development, and achievement of Kenya abroad. In this regard, today’s discussion touched on various sectors of engagement and investment by the Aga Khan Development Network (AKDN) in Kenya including Media, Economic, Tourism, Cultural, Health and Education sectors. The President commended the commitment of His Highness the Aga Khan to strengthening Kenya’s higher education system, including through major investment in the expansion of the Aga Khan University campus in Nairobi. The discussion also focused on the Government’s Big Four priorities and shared objectives in this regard. They agreed that the AKDN will continue to contribute towards addressing current national development priorities. They also discussed enhancing the quality of life of Nairobi residents by increasing the green spaces in the city through a project to restore Nairobi City Park to its original glory as the “Green Jewel of Nairobi” as quickly as the enabling conditions and instruments to conclude this partnership can be achieved. Both sides expressed satisfaction with the achievements of the visit by His Highness the Aga Khan to Kenya to commemorate the diamond Jubilee (60) years and agreed to work on the modalities for concluding outstanding issues. NAIROBI, ON 13TH APRIL 2018. His Excellency President Uhuru Kenyatta today welcomed Mawlana Hazar Imam at the State House in Nairobi on the second day of Hazar Imam’s Diamond Jubilee visit to Kenya. During the meeting, the two leaders discussed the long-standing partnership between the Ismaili Imamat and the Government of Kenya, which has spanned over 100 years and has contributed to improving the lives of all Kenyans. The AKDN is engaged in every sphere of development in the country: social, cultural, and economic. Through its several interventions in education, health, poverty alleviation, finance, insurance, tourism promotion, conservation, and civil society strengthening, the AKDN has been improving the quality of life of Kenyans, touching the lives of over 7.5 million Kenyans directly and 4 million indirectly every year. His Excellency President Kenyatta commended the commitment of Mawlana Hazar Imam to strengthening Kenya’s higher education system through the Aga Khan University as well as in the areas of education, healthcare, tourism, media, and economic development. The meeting confirmed a shared commitment to improving the quality of life for the people of Kenya through continued partnership. Tomorrow, Mawlana Hazar Imam will meet with the jurisdiction Jamats of Kenya, Madagascar, and the Democratic Republic of Congo. President Uhuru Kenyatta has welcomed to the country His Highness the Aga Khan who paid him a visit to State House Nairobi. 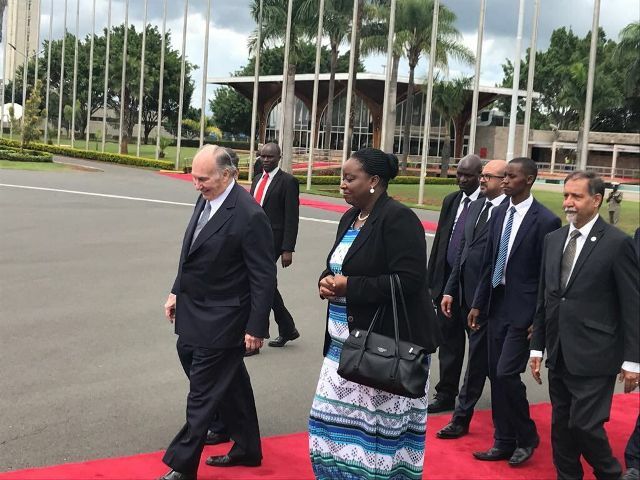 Aga Khan is in the country for the commemoration of his diamond jubilee in recognition of his sixty years since his accession to his role of spiritual leader. During the meeting at Statehouse, Kenyatta and Aga Khan engaged in discussions focused on the government’s big four agenda priorities and shared objectives. According to Statehouse Spokesman Manoah Esipisu, President Kenyatta and Aga Khan agreed on ways to enhance the quality of life of Nairobi residents by increasing the green spaces in the city through a project of restoring Nairobi city park to its original glory. President Uhuru Kenyatta on Friday met with his Highness the Aga Khan and discussed a project that will be implemented at Nairobi's City Park. Speaking at State House on Friday, Uhuru stated that the initiative was geared towards enhancing the quality of life of Nairobi residents. According to a statement released by State House spokesperson Manoah Esipisu the project is set to restore Nairobi City Park to its past glory as the "Green Jewel ofNairobi". Aga Khan is the current Imam of the Shia Imami Ismaili Muslims. Running into billions, the Aga Khan network runs hospitals, schools, banks, agricultural processing companies, media companies, insurance companies and civil society groups in Kenya, Uganda and Tanzania. When His Highness the Aga Khan, 49th hereditary Imam (spiritual leader) of the Shia Ismaili Muslims jetted in Kenya this week, it was more than a foreign dignitary visiting the country. Despite him receiving the official treatment given to international leaders, this is more of another trip to a country he knows so well and is known well. In East Africa, His Highness the Aga Khan is more than just a name: a philanthropist; a spiritual leader; a job creator; a business empire; a rural development crusader and above all public health service provider. From the Aga Khan group of schools, to the Aga Khan University Hospital and the Aga Khan Development Network, many people in the region have had an interaction with an entity or two that has a link to the Aga Khan network. Canada congratulates His Highness the Aga Khan, on his Diamond Jubilee. The Aga Khan will visit Canada to celebrate this anniversary. While in Ottawa from May 1 to 4, 2018, His Highness will attend a dinner at Rideau Hall, the official residence of the Governor General. The Aga Khan will then continue his visit to Canada, travelling to other parts of the country, including Vancouver and Calgary. Canada and the Ismaili Imamat have a long history of partnership with programs around the world that have a positive impact on people’s lives. We have worked together on a number of development and humanitarian initiatives that target the world’s poorest and most vulnerable, including women and girls. The Government of Canada and the Aga Khan are also partners in the Global Centre for Pluralism, which champions inclusive and accountable governance, respect for diversity and human rights. His Highness the Aga Khan is the 49th hereditary Imam of the Shia Ismaili Muslims, a global, multi-ethnic community whose members comprise a wide diversity of cultures, languages and nationalities, and live in Central Asia, the Middle East, South Asia, sub-Saharan Africa, Europe and North America. A devoted humanitarian dedicated to improving quality of life in less-developed regions of the world, His Highness the Aga Khan is the founder and chairman of the Aga Khan Development Network, one of the world’s largest private development agencies. In recognition of his contributions to human development and improving the condition of societies globally, the Aga Khan has received numerous decorations, honorary degrees and awards, including honorary Canadian citizenship and the Order of Canada. In February 2014, His Highness the Aga Khan was the first faith leader to address a joint session of the Canadian Parliament. The Aga Khan, one of the central figures in an ethics scandal involving the prime minister, will visit Canada to celebrate his Diamond Jubilee. Prince Shah Karim Al Hussaini, the Ismaili spiritual leader, will be in Canada from May 1 to 4, with the trip including a dinner at Rideau Hall and then stops in Vancouver and Calgary, according Global Affairs Canada. Over the last year, Trudeau has come under fire for taking a vacation to a private island owned by the Aga Khan. The prime minister and his family stayed at the Aga Khan's home on Bell Island in the Bahamas from Dec. 26, 2016 to Jan. 4, 2017. In December, the federal ethics watchdog found that trip violated some provisions of the Conflict of Interest Act. Trudeau apologized at the time, adding "In the future I will be clearing all my family vacations with the commissioner." The ethics commissioner also found that besides the post-Christmas trip, Trudeau had also accepted a vacation on the island for himself and his family in December 2014, and his wife Sophie Grégoire Trudeau set up a trip to the island in March 2016 with a friend of hers and their children. "When Mr. Trudeau, as prime minister, accepted the gifts of hospitality from the Aga Khan and the use of his private island in March and December 2016, there were ongoing official dealings with the Aga Khan, and the Aga Khan Foundation Canada was registered to lobby his office," Mary Dawson's office told CBC News in December. In February 2014, the Aga Khan was the first faith leader to address a joint session of the Canadian Parliament. He also met with Trudeau on Parliament Hill in 2016. Canada has worked with the Aga Khan Foundation on international humanitarian and developmental initiatives. This year is the diamond jubilee of his highness the Aga Khan, the leader of the world’s Shia Ismaili Muslims. I would like to express my gratitude to the Ismaili community for their exceptional commitment, under the Aga Khan’s leadership, to the betterment of the human condition globally and for their many achievements in Calgary and in Canada. It has been my privilege and honour to witness this work in Calgary and to travel to Pakistan to provide due diligence on some international educational projects operated by the Aga Khan Development Network. This network is a politically neutral, non-denominational agency, founded by and operating under the leadership of the Aga Khan. I have been humbled to experience the network’s deep commitment to social, economic and educational projects in some of the poorest and most vulnerable countries in the world. In a barren, forlorn region outside of Karachi, we stood on the site where a modern university for health and research now stands. We travelled to a region called Gilgit in the far north of Pakistan, between India and China, bordered by the Himalayas, where we visited a school for girls, started by the network. The students, daughters of illiterate local farmers, study in the bleak and cold in a school that is heated by smelly, portable kerosene heaters. We arrived on an 8 C Sunday afternoon and encountered them studying outside in the afternoon for light. They shared their dreams of attending Yale University or Stanford, to become astronauts, engineers, pilots and teachers. We all know what having hope, goals, mentoring and role modelling do to contribute to achievement. Their strong belief system is that ignorance, poverty, despair and, indeed, terrorism itself, are best tackled through education and improved literacy. This is why the network’s initiatives span 30 developing countries and why it works to improve literacy rates. They promote health care by training young women to go into rural areas to counteract prevailing myths about health and nutrition. The network also focuses on economic development and revitalization in these countries to improve quality of life. Ismaili Muslims share our values of service, ethics, civic responsibility and inclusiveness. In 2014, the Aga Khan, who is expected to travel to Alberta in early May, instituted the gift of time and knowledge as a legacy of his golden jubilee, whereby many Ismailis travel to spearhead and build the capacity of new projects, such as dentistry programs, schools and the like. They have enriched our Canadian mosaic by helping us to bridge divides. The Global Centre for Pluralism in Ottawa, the Aga Khan Museum in Toronto, and the soon-to-open Aga Khan Gardens in Edmonton are testaments of the contributions of his highness throughout the world. The Aga Khan received the first Adrienne Clarkson Prize for Global Citizenship in 2016 in recognition of his lifetime of work on improving the levels of education and health around the world. The Institute for Canadian Citizenship, co-founded by Clarkson and John Raulston Saul, of which I am a board member, works on the principles of inclusion to enhance active citizenship among our new Canadian citizens. In Calgary, I have experienced how community service and “giving back to one’s community” are part of the Ismaili DNA. Ismaili youth are raised with the expectation of doing volunteer service and they are involved in myriad projects. When 2,400 Afghan refugees came to Calgary, not only did the Ismaili community pledge to support them, but they promised to stick with arriving families until they were functioning successfully in Calgary. This included helping with their accommodations, accompanying them to school parent-teacher interviews, helping to translate our western culture to them, instilling pride in Canadian institutions among the new immigrants and helping them to learn or improve their English. When I want to be inspired, I think about Molodad in Gilgit, who is the head of the Professional Training Development Centre there. He is from a farm family of nine children and was the only one to attend school until Grade 8. He eventually attained a PhD from the University of Toronto and returned to work in Gilgit. In the context of our current political climate, I look to the Ismaili community, intent on helping people reach their personal potential through education, as a shining example of hope and optimism for the future of our world. This diamond jubilee is certainly occasion for us all to celebrate. Ruth Ramsden-Wood is former CEO of the United Way of Calgary and Area and a current board member of the Institute for Canadian Citizenship. Members of Calgary’s Ismaili Muslim community are preparing for a visit from the Aga Khan next month. The spiritual leader will be in Calgary from May 9 to 11 as part of a visit to Canada to celebrate his Diamond Jubilee anniversary. The Aga Khan will visit Ottawa from May 1 to 4, including attending a dinner at Rideau Hall, the official residence of the Governor General, and will also visit Vancouver as part of the trip. Rahim said she is part of a large team of volunteers from Calgary and Edmonton organizing the visit. She added the last time the Aga Khan visited Calgary was during his Golden Jubilee in November 2008. His visit in May will consist of private community gatherings. “It is an opportunity for the community to have a private gathering with His Highness and I think it’s one that many people have been really looking forward to — volunteers have been planning since the commemoration of the Diamond Jubilee last July,” she said. •His Highness the Aga Khan is the 49th hereditary Imam of the Shia Ismaili Muslims, a global, multi-ethnic community whose members comprise a wide diversity of cultures, languages and nationalities, and live in Central Asia, the Middle East, South Asia, sub-Saharan Africa, Europe and North America. •A devoted humanitarian dedicated to improving quality of life in less-developed regions of the world, His Highness the Aga Khan is the founder and chairman of the Aga Khan Development Network, one of the world’s largest private development agencies. •In recognition of his contributions to human development and improving the condition of societies globally, the Aga Khan has received numerous decorations, honorary degrees and awards, including honorary Canadian citizenship and the Order of Canada. In February 2014, His Highness the Aga Khan was the first faith leader to address a joint session of the Canadian Parliament. The Aga Khan IV, imam to the world’s 20 million Ismaili Muslims, will be in Vancouver from May 5th to 7th for meetings with his followers. The Aga Khan will likely not be giving interviews or engaging with the general public while in B.C. However, a Vancouver Ismaili lawyer and philosopher has put together an explanation, below, of the Aga Khan’s spiritual views. 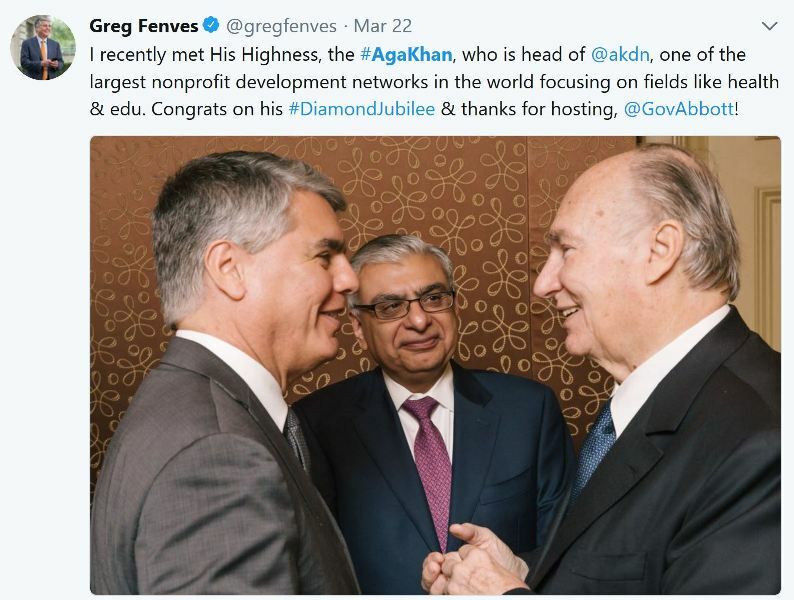 Most Canadians will know the Aga Khan as a friend of Prime Minister Justin Trudeau and, earlier, of Stephen Harper, as well as a global philanthropist. His full title is Prince Shah Karim Al Hussaini, Aga Khan IV. Forbes magazine describes him as one of the world’s ten richest royals. In Canada he will first visit with Ottawa politicians, followed by trips to Calgary and then Metro Vancouver (where there are roughly 16,000 Ismailis). This essay about the Aga Khan’s worldview is by Vancouver lawyer and writer Ali Lakhani, who is the author of Faith and Ethics: The Vision of the Ismaili Imamat. The book describes how Shia Ismaili Muslims are unique in following for centuries a living, hereditary imam, whom they believe to be directly descended from the Prophet Muhammad. For many Canadians, Prince Karim Aga Khan is somewhat of an enigma. Admired widely but also misunderstood, he remains a paradox. A Muslim leader who challenges stereotypes of Islam while transcending divisions of East and West, he is an international leader without a country, a quasi ‘philosopher-king’ who respects secular rights and champions civil society, a globalist who warns against the dangers of globalism, and an advocate of multicultural identities who opposes its tribalist expressions. His philosophy of integrating the material and spiritual dimensions of life is evident in his blend of entrepreneurial and humanitarian pursuits, modeled on the example of his forebear, the Holy Prophet Muhammad, from whom he is directly descended. For his Shia Ismaili followers, whom he is visiting in Western Canada as part of a worldwide tour to mark his Diamond Jubilee, he is their ‘Hazar Imam’ (living spiritual guide). On the occasion of his Jubilee (he became Imam 60 years ago, at the age of 21) it is opportune to reflect on some of his thinking. In an increasingly polarized world, he is wary of reductive thinking, whether secularist or religious. While not opposed to secular ideals, he rejects ‘unilateral secularism where the notions of faith and ethics just disappear from society.’ Equally he rejects attitudes of ‘theological colonialism’ which distort faith, or of politicized ideologies ‘sheltering behind the façade of the faith,’ stressing instead the ideals of diversity and tolerance. Noting that ignorance, arrogance, and insensitivity are attitudes that ‘rank high among the great public enemies of our time,’ he is a strong advocate of their antidotes: knowledge, humility, and empathy. Time and again, he has corrected mis-perceptions of Islam by stressing the nature of the faith and its ethos (that it is pluralistic and tolerant), its history (of convivencia, ‘a tradition of cultural exchange, tolerance and mutual understanding – even during conflictual situations such as the invasion by the Crusaders’) and its civilization (which is characterized not by a ‘clash of civilizations’, but of mutual ignorance and ‘historical amnesia’). It is a message much needed in our troubled world. housands of Ismaili Muslims in Metro Vancouver are preparing for the arrival of their spiritual leader, the Aga Khan. Prince Shah Karim Al Hussaini, the 49th hereditary leader of Nizari Ismailism, a branch of Shia Islam, is coming to Canada to celebrate 60 years — his diamond jubilee — as Imam. Kahleel Meghji says the Aga Khan's arrival will be special. "It's a really personally special time for every member of the community to spend time with someone who has really dedicated his life to improving the quality of life for Ismailis and for people who share our communities," he said. Al Hussaini has held the position since 1957 and is an advocate for eliminating global poverty, promoting secular pluralism, advancing the status of women and honouring Islamic art and architecture. He was named an honorary Canadian in 2010. The Aga Khan will be in Canada May 1-4. The trip includes a dinner at Rideau Hall in Ottawa and then stops in Vancouver and Calgary, according to Global Affairs Canada. He wi a central figure in an ethics scandal involving Prime Minister Justin Trudeau, after Trudeau stayed at the Aga Khan's home on Bell Island in the Bahamas over the 2016 Christmas holidays. In Vancouver, he will host around 20,000 people from across the province at B.C. Place over Saturday and Sunday. Saira Suleman is one of around 5,000 volunteers working to make sure the visit goes well. "I think it's a really special time," she said. "I think with all of he joy and excitement that's been going around the community, I think being able to help and being able to give back and support one another through this journey is really important." Many like Suleman say volunteering is an important part of their faith and the Aga Khan is their inspiration for that. "You just have to serve," said Azim Raghavji. "I mean how can you not? And it can be simple as like ... serving a glass of water to a senior. "It's in my DNA and it's something I will forever continue as it brings me quite a bit of joy and happiness," said Shelina Dilgir. With files from Chad Pawson. An earlier version of this story stated that the Aga Khan was leader of the Shia branch of Islam. In fact, he is leader of Nizari Ismailism, a branch of Shia Islam. Prime Minister Justin Trudeau will dine with the Aga Khan on Wednesday — part of the spiritual leader's tour through Canada to mark his diamond jubilee. The Prime Minister's Office confirmed Trudeau and the Aga Khan will share a meal at an event hosted by Gov. Gen. Julie Payette at Rideau Hall, the official residence of the Governor General. "Canada and the Ismaili Imamat have a long history of partnership with programs around the world that have a positive impact on people's lives. We have worked together on a number of development and humanitarian initiatives that target the world's poorest and most vulnerable, including women and girls," said a press release from Global Affairs Canada announcing the Aga Khan's visit. The Aga Khan will also travel to Vancouver and Calgary as he celebrates 60 years as the spiritual leader of the Ismaili Muslim faith. Known for his charitable work, the Aga Khan was at the centre of a political headache for Trudeau last year when it was revealed the prime minister traveled to the Muslim leader's private island in the Bahamas for a Christmas vacation. The former ethics commissioner, Mary Dawson, ultimately found the vacation breached four sections of the Conflict of Interest Act. She criticized Trudeau for failing to consider the potential ethical pitfalls of accepting a free vacation to the private island when the federal government has dealings with the Aga Khan's foundation. Trudeau defended the trip as a chance to spend time with an old friend. In her report, Dawson concluded that — apart from the Aga Khan's attendance at the funeral of his father, Pierre Elliott Trudeau, in 2000 — the younger Trudeau had no interactions with him between 1983 and the fall of 2013, a span of 30 years. Trudeau and his family stayed at the Aga Khan's home on Bell Island in the Bahamas from Dec. 26, 2016, to Jan. 4, 2017. Trudeau later publicly confirmed he was taken there by the Aga Khan's private helicopter. OTTAWA, May 1, 2018 /CNW/ - His Highness the Aga Khan arrived in Ottawa today as part of an international celebration of his Diamond Jubilee, marking 60 years as spiritual leader of the global Shia Ismaili Muslim community. The visit takes place at the invitation of the Government of Canada and includes an official dinner at Rideau Hall on May 2, hosted by Her Excellency the Right Honourable Julie Payette, the Governor General of Canada, meetings of the Global Centre for Pluralism; and community gatherings in Vancouver and Calgary. The visit is an acknowledgment of the strong relationships between the Aga Khan and Canada over the course of the past six decades. "The Diamond Jubilee provides an opportunity for people everywhere, here in Canada and elsewhere, to re-dedicate themselves to the ethics and values that underpin our partnerships with communities around the world to help improve quality of life. It is an opportunity to give back and look forward," said Mahmoud Eboo, Aga Khan Development Network (AKDN) Representative to Canada. Remarking on the importance of this visit, Malik Talib, President of the Ismaili Council for Canada added that the visit was "an opportunity to celebrate the deep and lasting relationships he has built with Canadian institutions over his 60 years of service and to recognize the contributions of Ismaili Canadians from coast to coast." The Aga Khan was greeted on arrival by the Honourable Marie-Claude Bibeau, Minister of International Development and La Francophonie; Marc-André Blanchard, Ambassador and Permanent Representative of Canada to the United Nations; various members of Parliament and other civil society leaders. The Aga Khan is an honourary Canadian citizen and Companion of the Order of Canada, and in February 2014, became the first faith leader to address the Canadian Parliament. He has partnered with Canadians institutions and governments on a wide variety of projects in Canada and globally to promote inclusive, sustainable development and improve quality of life. "So many Canadians across the country have strong affinity and engagement with the Aga Khan's institutions and the causes he champions, including a commitment to pluralism," said Khalil Shariff, CEO of Aga Khan Foundation Canada. "These partnerships have improved the lives of millions around the world and continue to promote our shared Canadian values of humanitarianism." The lasting collaboration between Canadians and the Aga Khan is rooted in what His Highness has called "a remarkable convergence of values," embodied in a mutual dedication towards improving the condition of society's most vulnerable, and a respect for diversity and human dignity. On July 11, 1957, the Aga Khan became the 49th hereditary spiritual leader (Imam) of the Shia Ismaili Muslims. In Islam's ethical tradition, religious leaders not only interpret the faith but also have a responsibility to improve the quality of life of their community and the wider societies in which they live. One way in which the Aga Khan has chosen to do this is through the establishment of the Aga Khan Development Network, a group of private, non-denominational agencies that address the social, economic, and cultural dimensions of development in 30 countries around the world. July 2017 marked the 60th anniversary, or Diamond Jubilee, of the Aga Khan's spiritual leadership of the Ismaili community. Historically, the Ismaili Imams have used jubilees as opportunities to create institutions and initiatives that have lasting social, economic, and cultural impact. In November 2017, the Aga Khan launched the Global Pluralism Award – a Diamond Jubilee initiative recognizing people and organizations of all nationalities that contribute to building societies where human diversity is respected and valued. The Award is presented by the Global Centre for Pluralism, an organization established by the Aga Khan in partnership with the Government of Canada to advance positive responses to the challenge of living peacefully and productively together in diverse societies. Imamat initiatives in Canada include the Delegation of the Ismaili Imamat in Ottawa, the Aga Khan Foundation Canada, Ismaili Centres in Burnaby and Toronto, and the Aga Khan Museum and Park in Toronto. The Aga Khan Garden will open later this year at the University of Alberta in Edmonton. In recognition of his contributions to human development and improving the condition of societies globally, the Aga Khan has received numerous decorations, honorary degrees, and awards from Canadian institutions, including honorary doctorates from McGill and McMaster Universities, the University of Alberta, the University of Ottawa, and the Pontifical Institute of Medieval Studies at the University of Toronto.